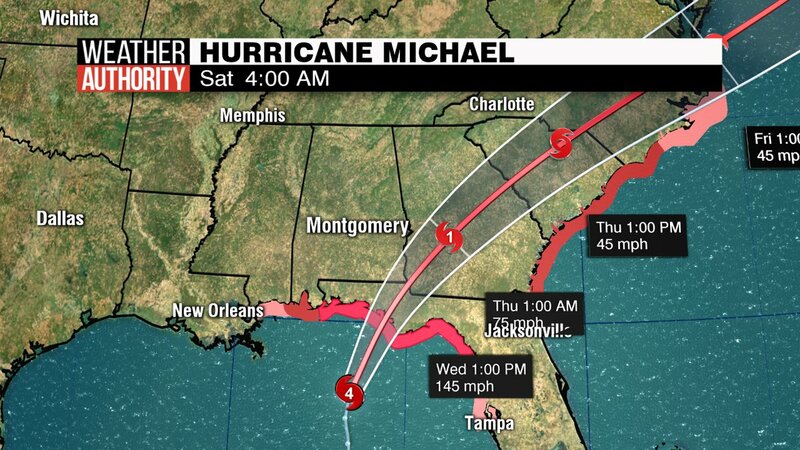 Michael continues to weaken and move away from us! 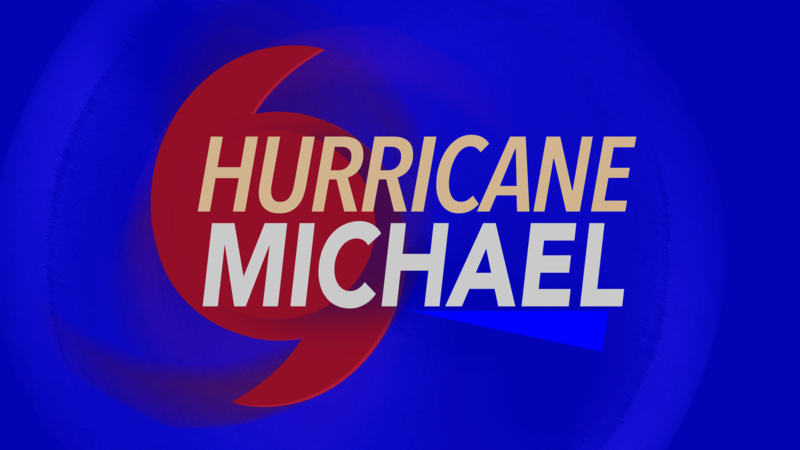 Hurricane Michael continues to weaken with max sustained winds now down to 90 mph near the center. Tropical storm force winds (39 mph+) will be possible mainly over our southeastern counties (Pike & Bullock). Michael will move rapidly northeastward this evening and our weather will quickly improve overnight and early Thursday morning. We’re finally going to get a taste of Fall on Friday. High temperatures top out near 80 with sunshine and a nice northwest breeze. Saturday and Sunday look excellent with abundant sun and highs in the upper 70s to low 80s. The next chance for rain won’t be from a tropical system, but we could see some showers early next week. Temperatures stay seasonable with highs in the 70s Monday through Wednesday. Reports from an Air Force Reserve Hurricane Hunter aircraft indicate that maximum sustained winds have increased to near 140 mph (220 km/h) with higher gusts. Michael is an extremely dangerous category 4 hurricane on the Saffir-Simpson Hurricane Wind Scale. Some additional strengthening is possible before landfall. 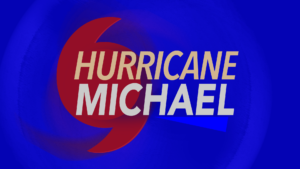 After landfall, Michael should weaken as it crosses the southeastern United States. Hurricane-force winds extend outward up to 45 miles (75 km) from the center and tropical-storm-force winds extend outward up to 185 miles (295 km). NOAA buoy 42039 to the northeast of the center recently reported sustained winds of 54 mph (85 km/h) and a wind gust of 63 mph (101 km/h). The estimated minimum central pressure based on Hurricane Hunter aircraft data is 943 mb (27.85 inches). A Hurricane Warning is in effect for Alabama/Florida border to Suwannee River Florida. A Tropical Storm Warning is in effect for Alabama/Florida border to the Mississippi/Alabama border and Suwanee River Florida to Chassahowitzka Florida. WIND: Hurricane conditions are expected within the hurricane warning area along the U.S. Gulf Coast today, with tropical storm conditions expected to begin during the next few hours. Hurricane conditions will also spread well inland across portions of the Florida Panhandle, southeastern Alabama and southwestern Georgia. Tropical storm conditions are expected in the tropical storm warning area during the next several hours, and are possible within the tropical storm watch area by that time. Hurricane conditions are possible within the hurricane watch area today. Tropical storm conditions are expected to spread northward within the warning area along the southeast U.S. coast beginning tonight, and are possible in the watch area by late Thursday and Thursday night. RAINFALL: Michael is expected to produce the following rainfall amounts through Friday…Florida Panhandle and Big Bend, southeast Alabama, and portions of southwest and central Georgia…4 to 8 inches, with isolated maximum amounts of 12 inches. This rainfall could lead to life-threatening flash floods. The remainder of Georgia, the Carolinas, and southern Virginia…3 to 6 inches, with isolated maximum amounts of 8 inches. This rainfall could lead to life-threatening flash floods.